If you haven’t heard of Forevermark, there is still a strong likelihood that you have heard of De Beers. Giants in the world of diamond mining, De Beers controlled most of the world the diamond market (and indeed, it’s prices) up until the 1990’s. The discovery of new mines around this time opened the market up to new contenders, threatening the strong monopoly that De Beers had held since the 1800’s. Since then, the playing field has been levelled and as a result, De Beers have chosen to diversify their business model, transitioning from dealing exclusively in rough diamonds, to consumer focused, retail sales. In 2011, Forevermark was born, and De Beers seamless first step into the retail world had been taken. For the skim readers and tab jumpers out there (although I strongly suggest a thorough read to be in possession of all the facts), I feel obliged to say this early on – Forevermark is a division within the De Beers family; this does not mean that the Forevermark brand can be assumed to hold the same standards or prestige that is so naturally partnered with the De Beers name. It is worth remembering that the huge powerhouse of De Beers become known to the general public as a result of their hugely successful advertising campaigns (A Diamond is Forever, Three Months Salary etc.) The advertising and branding may be just as on point when it comes to Forevermark, but does their jewelry perform as impressively as their ad campaigns? As always, I have reviewed the Forevermark brand without any biases, looking simply at the jewelry and diamonds themselves. It may not be so easy for shoppers to do the same, as the De Beers name is elegantly shoe-horned into every blank space on the Forevermark website and advertising. High-end, fashion style photographs and a clean black and white colour scheme make the Forevermark intentions clear, and an article explaining how to take the ‘perfect engagement ring selfie’ seals the deal; yes, Forevermark is De Beers’ blinding sweep at the millennial market. Nevertheless, the website, advertising and packaging certainly deliver on a promise of luxury and elegance. The intention was to create a contemporary brand that could compete with Tiffany and Cartier – Forevermark may lack the rich history of its competitors, but the branding and overall ‘luxury’ finish fits the bill. There is nothing wrong with covering a few bases when it comes to diamond quality, in fact this approach is used by the majority of diamond retailers, accommodating a variety of budgets and desires. It does, however, beg the question, what makes a Forevermark diamond any more ‘beautiful’ or ‘rare’ than its competitors? I will take a closer look at questions of quality later on. In short, promises of 1% diamonds, rare, beautiful etc are just examples of marketing tactics. Yes, diamonds can be beautiful (and some Forevermark diamonds are) yes, by their very nature diamonds are rare, and 96% of the diamonds available on the retail market are ethically sourced. This promise says very little to set Forevermark diamonds apart. The most notable and concerning aspect of Forevermark diamonds is their certification. Forevermark diamonds are certified in-house: this is an immediate red flag. We must set aside the prestige of the De Beers brand and look at this fact as we would any other diamond seller, and the simple truth is that I would never recommend buying diamonds that have not been certified by an unbiased, external certification body. The purpose of having a diamond certified by an internationally recognised institute (such as the GIA or AGS) is that these lab reports give a standardised grading on all factors pertaining to the quality of the diamond. This allows the buyer a clear understanding of the diamond’s quality and also allows them to make informed choices when it comes to the price. These lab reports are objective and consistent, with each diamond being scrutinised and graded to the same standard and against the same quality brackets. Cut is the most important of the four C’s, having the biggest impact upon the appearance and price of a diamond. The Forevermark certificate grades their diamonds as ‘very good’ or ‘excellent’ but gives no indication as to what these grades really mean. We don’t know if a Forevermark ‘Very Good’ is equal to a GIA ‘Good’ or an AGS 6. The Forevermark grades mean nothing without a benchmark or set cut parameters. If you find yourself faced with a Forevermark salesperson, you will also be hearing a lot about the inscription. Forevermark diamonds are inscribed with a unique number and the Forevermark icon, on the table facet of the diamonds. 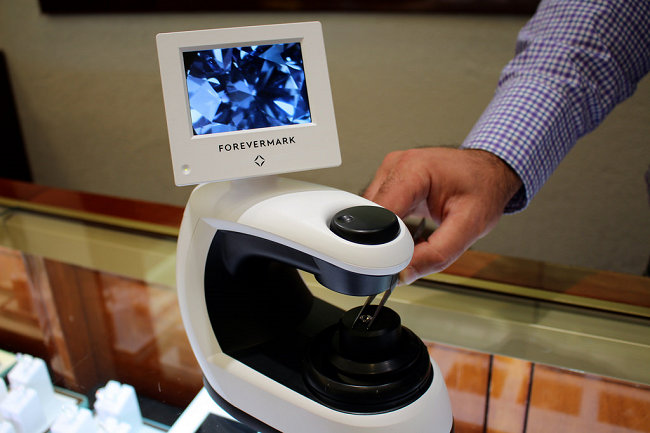 Retailers of Forevermark diamonds are fitted with a ‘viewer’, essentially a Forevermark branded microscope, powerful enough to see the inscription. Having an inscription on your diamond is certainly a benefit, however GIA and AGS diamonds are also inscribed – these inscriptions are on the girdle, as is standard practice. There is no clear benefit to having an inscription on the table facet, as neither method makes a difference to the visual properties of the diamond. Again, it is an example of a sales gimmick with no real benefit to the buyer. When it comes to engagement rings, Forevermark really do stand out. Their designs are truly innovative, creative and exceptionally well executed. Their pave is sublime and each engagement ring has an effortlessly luxury ‘sheen’ about it. The Greek-inspired Encordia collection is an excellent example of the kind of unique craftsmanship on offer in the Forevermark collections. The bad news, is that any collaborations with designers will only be available through a Forevermark retailer. The even worse news, is that Forevermark jewelry is not sold online at all. You can only purchase their jewelry through a bricks and mortar retailer, meaning the premium goes up even further. Nevertheless, if you fall in love with one of their masterfully designed rings, you will be hard pressed to find anything else like it. Experience – The brands are established, therefore knowing what works and what doesn’t. You assume a higher level of customer service from the bricks and mortar stores, and an overall better experience. Quality – Tiffany diamonds are certified in-house. They are the only brand who get away with it. Their diamonds are expensive, but they are good quality. The Name – People really are willing to pay more for a name. Forevermark does not deliver on these aspects as successfully as other luxury brands. There is a lot of smoke and mirrors when it comes to Forevermark. If we compare their approach to Whiteflash, we can see a huge difference in their attitude towards sales. 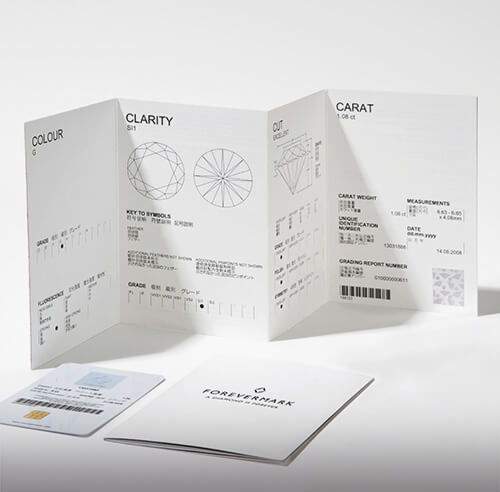 Whiteflash use extensive educational pages and the most accurate diamond analysis technology possible in order to give potential buyers the full picture (ASET, Hearts and Arrows Imaging, Sarin Reports, High-Res Imaging etc). They have complete confidence in the quality of their diamonds, and use explanation and evidence in order to sell them. 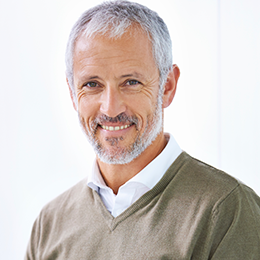 By contrast, Forevermark is entirely geared towards an ‘in-house’ experience. This means that the interaction will be entirely led by a salesperson, who will be more interested in their ‘cutting edge’ inscription, than in the quality of the diamond. Learn more about the importance of light performance images and HD videos here. When I look at Forevermark jewelry, I cannot help but think, ‘what a shame’. If Forevermark utilised independently graded diamonds, their engagement rings and bridal jewelry would be some of the most beautiful out there. Unfortunately, it is not a flaw that can be overlooked, as it is the most important element in a diamond engagement ring. The modern diamond buyer is an informed buyer – the increased information and rise of online diamond vendors has shone an unflattering light on the traditional jewelry store. If you want a stunning engagement ring, a high-quality diamond is of paramount importance. I would recommend taking a look at Whiteflash for their impressive inventory of Ideal Cut diamonds and huge variety of designer engagement rings. I would also consider looking at Blue Nile if you need something slightly cheaper, but of a lower cut quality, and James Allen.